Barb Richard and Mon Homme. Photo by Doreen Kirk. The romance of driving has taken on a new twist through the local Klondike Driving Chapter. This small but enthusiastic group of drivers based around Edmonton are hosting a fun horse driving event Aug. 14-15, 2010, at the Beaumont Agricultural grounds. The event is dubbed the Klondike Klip Klop Klassic. The Klondike Driving Chapter welcomes spectators Aug.14-15 from, 7 AM – 5 PM. Please no dogs for safety reasons. Admission is free, food is available. Come on out and participate, view the variety of horses and driving vehicles, and chat with the drivers. And of course, visit with the horses. One of the club’s members is Barb Richard has competed with her 15-year-old registered Arabian for eight years. The introduction to driving came through a neighbour who invited her to volunteer as an obstacle timer at a competition. After making a harness purchase and discovering it was not complete or safe, she looked for a mentor to help her down the carriage lane. There is now a multi-generational interest in the family since introducing her daughter Beckie to the sport through grooming (assisting on the driving vehicle). Richard says she, “really loves having the family help and especially the grand kids cheering her on during a competition”. A nurse by profession, Richard has always been motivated by learning. When she discovered there were vary few coaches in the province she earned an Equine Canada, Certified Driving Coach, Level 1 accreditation. Motivated by the course, Richard has gone on to promote driving with a focus on safety for driver and horse. Leadership is being shown by many of the Klondike Chapter members by hosting learning to drive clinics; along with sharing of driving knowledge is helping to revitalize driving in the Edmonton area. 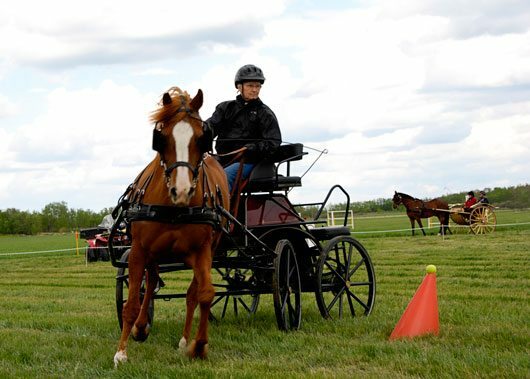 This provides opportunities for new drivers to get some experience and the event this year is a fun Klip Klop Klassic featuring the three parts of a horse driving trial. The driven dressage portion tests the obedience, freedom and regularity of the team (horse and driver) as they complete a pre-set pattern. They are judged on safety of the harness and rig as well as the overall appearance of the team. The marathon is a cross country course incorporating five natural or man-made ‘obstacles’ that must be driven in the correct sequence. This is a timed event where penalties are assigned for too little or too much speed, accuracy of completing the obstacles and driving protocols. The marathon is exciting to watch as it is the ultimate test of fitness and stamina of the horse, driver, groom and equipment. The cones course consists of 16 to 20 pairs of traffic cones with tennis balls balanced on top. The driver is given a limited clearance between the cones and penalties occur for knocking over the cones or dislodging the balls. Similar to the marathon and dressage portions, the driver must complete the pattern showing accuracy and skill. Many teams of volunteers are also needed to assist with judging the marathon course. If you can help please call Arlene at 941-2358 before August 13. Directions from Edmonton, south on Hwy. 2 to Nisku exit (Sec.625), east to Beaumont, north on Sec. 814 to 50St., west approximately 2 km, follow signs. The Equine Canada Statement of Principle supports adherence to humane treatment of horses in all competitions and is strictly followed.